There are few hand gestures as nuanced and versatile as giving someone the middle finger. It's such a useful gesture in fact that it became an official emoji last year. Yet despite that Apple, Google and other tech companies have been resistant to it and so far neither iOS nor Android supports the gesture. Microsoft has proven more enlightened though, as according to Emojipedia the tech giant has added support for the "reversed hand with middle finger extended" to Windows 10, allowing users to show friends, family, colleagues and strangers what they really think of them whether on mobile or a desktop computer. Convenient! 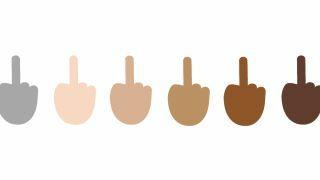 But don't worry, Microsoft doesn't want to offend anyone, so it's allowing users to send the middle finger in a range of different skin tones from pale through to black, as well as a race-neutral grey shade. Stop everything! There are Star Wars emojis.